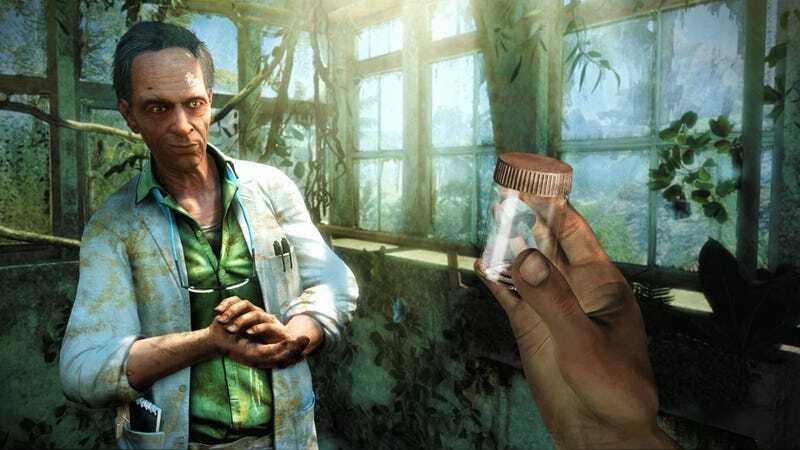 Oh, how we try to fix Far Cry 3. Despite noble intentions, everything about the actual story and writing is terrible and shallow. Kirk had an idea about how to fix it: make it so that Jason Brody turns out to be Vaas! But maybe that idea ain't crazy enough. We need even more insanity. Think like Mass Effect 3 ending type insanity. Remember the indoctrination theory? To simplify, the theory postulated that the ending didn't actually happen—it was a hallucination. Shepard has actually been indoctrinated by the reapers. You can read the specifics of why some people believe this here. It's a doozy. The easiest example of this comes in the boss fights, which are quick-time events that take the form of knife fights. When your character gets into these fights, the game's world falls away, and you instead see a nightclub that Jason and his friends had been in before the game proper started. This could be understood as a metaphor for the "dance of death" that is the knifefight, but it's more than that. In one of the fights, Jason is stabbed, through the chest, with a large knife, but he proceeds to fight and win, with no apparent side effects. The final confrontation is even more nonsensical: you argue with the villain in his lair filled with his guards, he starts stabbing, the room changes to the dance club, you fight back, stab him, kill him... and all of the guards are also dead. What's up with that? There are a lot of unbelievable things that happen in the game. Kaiser has an answer: maybe the game isn't real. I mean, you periodically have hallucinations in the story, right? If you eat the pills in the cave, that is. Who is to say the entire thing isn't some giant hallucination? It would explain why you suddenly turn into a fierce warrior who can command the fear and admiration of an entire island. Sound unbelievable? Perhaps you should read the full write-up here. I'm compelled. But I may also just be desperate to try to meet Jeffrey Yoholem, Far Cry 3's lead writer, halfway with his aspirations. What do you think though? Are you convinced, is it plausible that the entire game isn't exactly 'real'?